Aileen wandered around Beale Street for about an hour after having a late lunch at the BB King's Blues Club. While she appreciated the ambiance of the restaurant and the hickory smoked burger platter with the sides of fried dill pickles and catfish nuggets were out of this world, rhythm and blues wasn't exactly her favorite kind of music and so didn't stay there any longer than it was necessary until she had finished her meal. She made a mental note to bring her little baby girl, Leigh here and maybe visit Graceland the next time she can manage to go to Nashville. The hell with them. They push then she'll push back...and Aileen Baker was not alone in this. Her cousin, Daniel and his KKK contacts made certain that Leigh was off limits to the worst of their scrutiny or risked a "heart to heart" visit in the middle of the night. The Promethean Institute also applied their own subtler pressure of the local authorities as well. But such events were trivial today as this was Aileen's first solo outing away from the Institute in weeks after the overhaul they have done to her arms and legs after the battle with Tailgator and she wanted to make the best of it, first taking a Memphis tour bus to orient herself around town and then once she had memorized some of the major streets, ditched the bus the first chance she got. She felt confident that she can run back to the Institute without using one of those gizmos...what the heck were they called again? GPS or FBI or something like that. The last time she carried such a thing was during a field test near Kilowatt Lake where she had to run across it while being bombarded with EMPs from a machine one of the scientists was carrying. No matter how much she pleaded with the eggheads, for some reason they thought having super speed meant you can somehow breathe underwater and just run straight down to the bottom of the lake to retrieve one already broken piece of equipment. The end result: one $1,500 piece of equipment was still sitting on the bottom of the lake and Aileen spent three days in recovery. Of course the technicians blamed her for not knowing how to swim. They later told her they were working on a redesign of her costume which would allow the Institute to completely monitor her very movement no matter the distance. Ally didn't what to make of that nor did she liked when the talk turned to the possible uses of the tracking devices in the cybernetic limbs. She wore a stylish beige coat over her costume and sunglasses as a vain attempt at disguise. Not that it did her any good as she was sort of well known thanks to a few Promethean sponsored commercials all over the cable networks as well as the web which showcased her being Tachyon (still a stupid name in her own private opinion), one of the first of Tennessee's public superheroes although she did little besides smile and wave to the cameras and then run like the wind at a couple of public events. Not the best of choices, but Aileen made her bed and now must lie with it. An annoying look came to Aileen's face as the dreaded ringtone: Phil Collins' "Another Day In Paradise" suddenly blurted out of her smartphone. "What in the sam hill is it now, Doc?" she answered moodily. "Ahm busy." "Now, now." came the smug voice of Doctor Silas Moore, head of the Promethean Institute. "An excellent opportunity has arisen and we feel that its time for Tachyon to become more proactive for the city." "You are aware of course of the recent events at the Federated United Bank?" "Ya mean with the ni...err...ah mean Neutron? Ah thought he usually sticks around north in Emerald City? What he's doin' 'ere and handlin' a simple robbery with some cheap thugs?" "He does. Neutron is currently in Memphis for an photo shoot for the making of a music video when he happened upon on the crime but more importantly the fact there were... others involved in this so called simple robbery." "Who can say? Trained people with high tech gadgets? Metahumans?" Aileen suppressed a shudder at the last word. "Nevertheless this bears looking into. A few of them has stolen an armored car on its way to the bank after the people were saved from the robbers by Neutron. The recent reports stated that the car went over the I40 Bridge and fell into the water." "Did they find anythin', Doc?" "So far, no. But we are looking into what was stolen. We know that it was not money since it was confirmed by the armored car company though they are most stubborn in revealing more information. In the meantime see what you can find out. Frankly the area where the car was last seen should be fairly easy to locate." "Gotcha, Doc." She shut off the phone and looked around for a safe hiding place to store her stuff until she can reclaim them as the high velocity speed might damage them. And she did like the coat. After finding a suitable location, Tachyon sped out of Beale Street as fast as she could, her body a blur. Twelve seconds later, she arrived at the scene where the armored car had crashed into the river. Apparently there were quite a few police officers and twice as many reporters and tourists still milling about the shoreline. Tachyon put on her best smile forward and rushed toward the crowd. Well 'rushed' was not the right word as she easily crossed the distance instantaneously. Of course all of a sudden camcorders and cellphone cameras all focusing on her. "Who are you?" asked a reporter, obviously an out of townee. "Say what, sugah? Ya been livin' under a rock or somethin'? Doncha know who ah am? Ah am called Tachyon." she said with a straight, smug face and doing what she felt was a dramatic pose. Dang it, did that ever come off as cheesy? Ah feel like ah belong in the circus all dressed up as a clown! "I have a question." a deep voice said seemingly above her. "Is there any truth to the allegations that your corporate sponsors are charged by the Tennessee State Court with trademark infringement?" 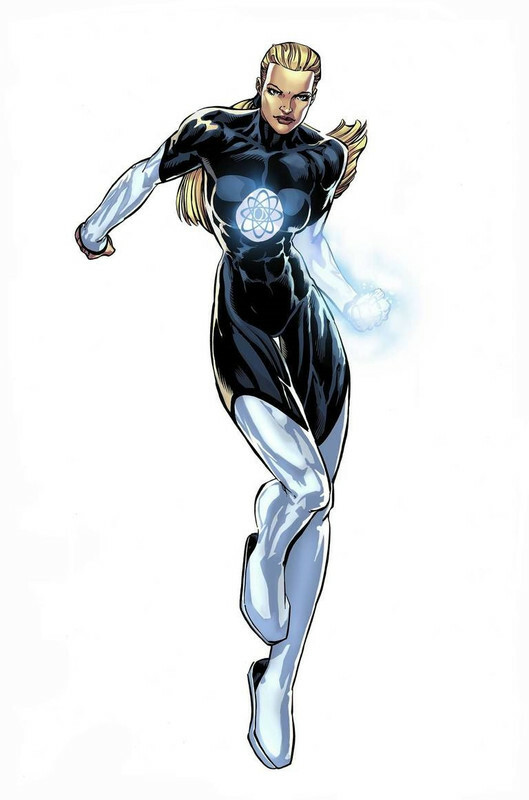 Tachy froze and looked up at the figure surrounded in a glowing white energy field landing next to her. "Why howdy, Lloyd." "HOLY CRAP!!! ITS NEUTRON!!!" screamed out a tourist. "Thanks, Captain Obvious." Tachyon and Neutron said at the same time.